The seasons are playing tricks on us with cold temperatures following warm. While we go through this latest cold snap, which I have high hopes will be the last, I want to address a landscape issue that’s generating quite a few questions. It’s not a new issue, as it pops up at this time every year. And it’s not the annual, angst-causing pruning of the crape myrtles. I want to focus on a subject I write about most years, and that is lichens. Lichens become prominent and concern many gardeners who venture out in the nice, early spring weather to take stock of their landscapes and gardens. This is a time of the season when many deciduous trees and shrubs haven’t started to leaf out for the year, and lichens become very noticeable. This gray-green, moldy-looking material is actually an organism called lichen, an unlikely combination of fungus and alga that lives in a symbiotic relationship on plant bark. The alga supplies the food via photosynthesis, and the fungus gathers the water and other needed nutrients. Lichens are very interesting organisms that are found throughout the world. They are always on tree trunks, which they use only for support. In fact, lichens will grow on any hard surface outdoors, from wooden fences to rocks and birdhouses. I’ve even seen them growing on a satellite dish. 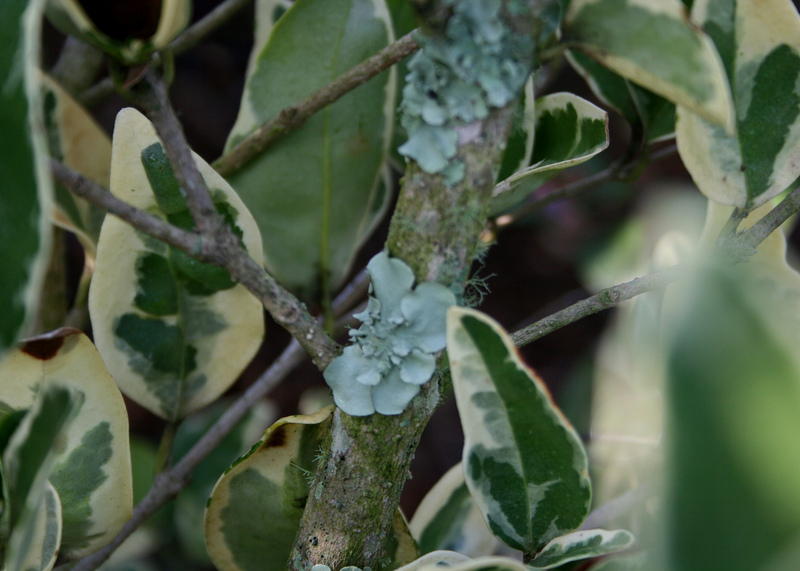 Now, it is true that lichens are more likely to be seen on stressed woody trees and shrubs. The canopy or leaf cover on these struggling plants tends to thin out, letting more light into the interior of the canopy. Since the alga carries out photosynthesis in the higher light situation, the lichens grow more noticeable in these situations. 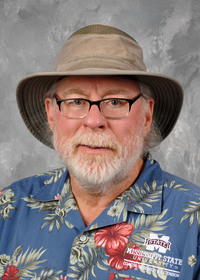 They get blamed for the plant decline when, in fact, the stresses causing the problems are abiotic and environmental, like drought or excessive heat. Lichens come in several forms, from spreading and crusty to wavy folds and specimens that look like hairy, multi-branched balls. Late winter and early spring create the perfect environment for lichen growth. After a rain, the lichens can appear to bloom as small, round structures appear and produce spores. It really isn’t necessary to remove these naturally occurring organisms. 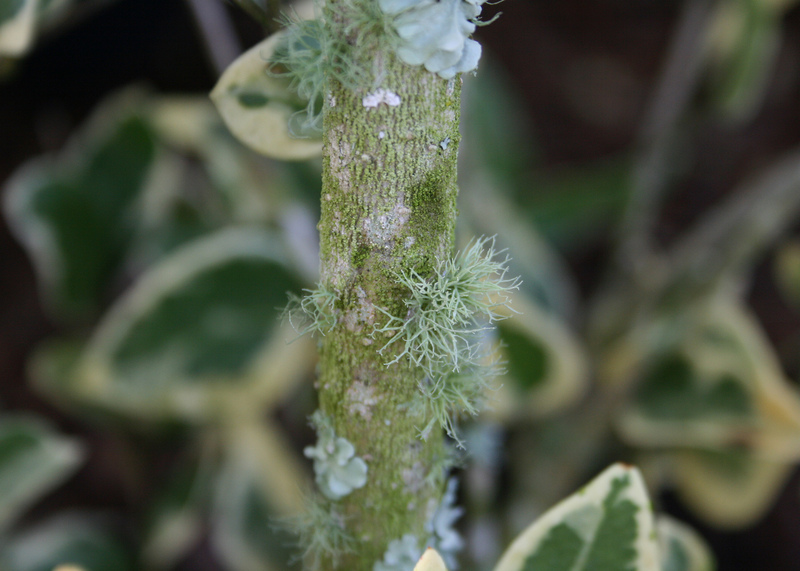 The best strategy to ward off unwanted lichens is to keep the landscape plants in optimum condition. A healthy and well-growing plant has a canopy that discourages lichen growth. Be sure to follow the Mississippi State University Extension Service recommendations for watering, fertilization and other best management practices. Light pruning of damaged branches encourages new branch growth, which, in turn, helps establish a denser canopy. I personally think that lichens add a touch of patina to our landscape plants, so sit back and enjoy the lichens that appear in your landscape this spring.